Re cap of Sketch Challenge 88! More ideas with our chalks! Re cap of Sketch Challenge 87! Blogger's Crushed Mambo Chips Mojo Style! Making what you HAVE work! Re-cap of Sketch Challenge 86 players! Thinking of you is a nice thing to do! Help me choose my new hair style! I finally got to stamp--but only one card. Girl you are one COOL cat! Hello to you. As usual today's card is for more than one challenge. As you can see by my title it is for the Three Clover's Thursday Challenge which is to "think pink" and make a card using pink. I am also using the SC from SCS again, I really think this is a fun sketch. And last but not lease this is for the SUDSOL Design Challenge--non traditional color on a Christmas card. 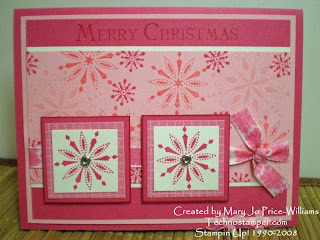 I think pink is so fun for Christmas, don't you agree?? 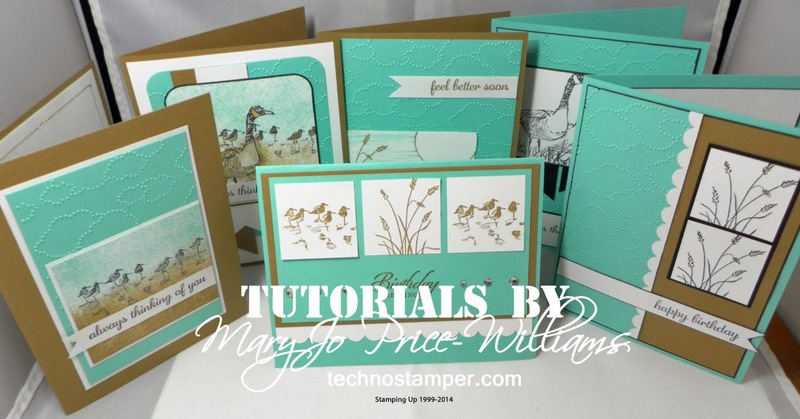 Don't forget to play along in the ALL NEW Technostamper Super Set Sampler Challenge. You can add cards you already made or make new ones. 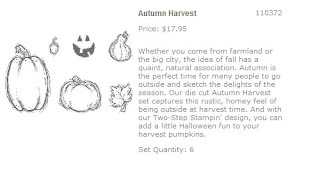 This week's featured set is Autumn Harvest. You can get more details HERE. Welcome to week number 2 of this Brand New Challenge! Come on and play along! I am so excited about this new challenge! It will be so fun to have tons of 100% current samples shown by set. Don't you think? Here is the basic idea of the challenge. The challenge will be called Technostamper's Super Set Sampler Challenge (T3SC2). 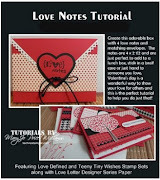 In honor of my love of Stampin Up stamps I will be doing this new challenge. The idea is that each week I will pick a set and make two cards with the set to start us off and hopefully inspire you to use the set too. I realize that you will not own all the sets that I do but you will get tons of fabulous ideas to share with your friends/customers. And of course you may fall in love with the set and realize you HAVE to have it! So I hope that you will play along on week's that you have the featured set, and visit on week's that you don't. Soon we will have so many wonderful ideas to use with our sets. 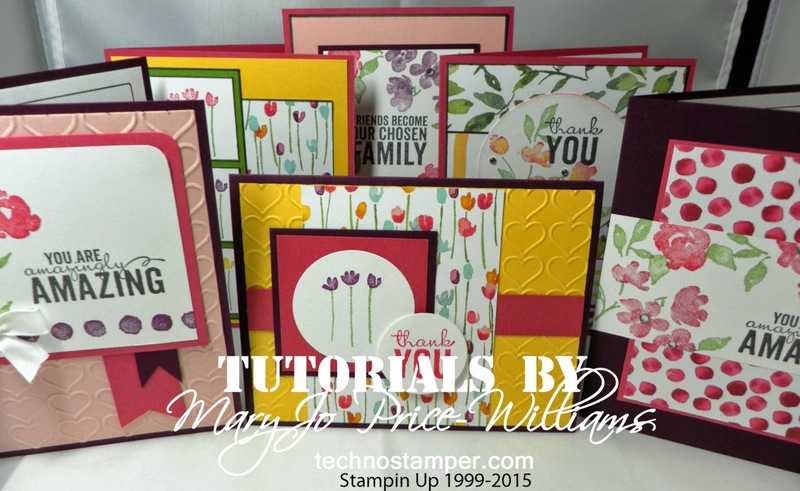 The catch to this is that ALL SAMPLES MUST BE 100% CURRENT STAMPIN UP! SAMPLES. It is a challenge after all but I know you are all up for it. Are you in? I will be giving a $5 voucher each week for SU product --redeemable through me. You can accumulate them up to $25 before spending. So you will want to play as often as you can to earn lots of free stuff of your choice. 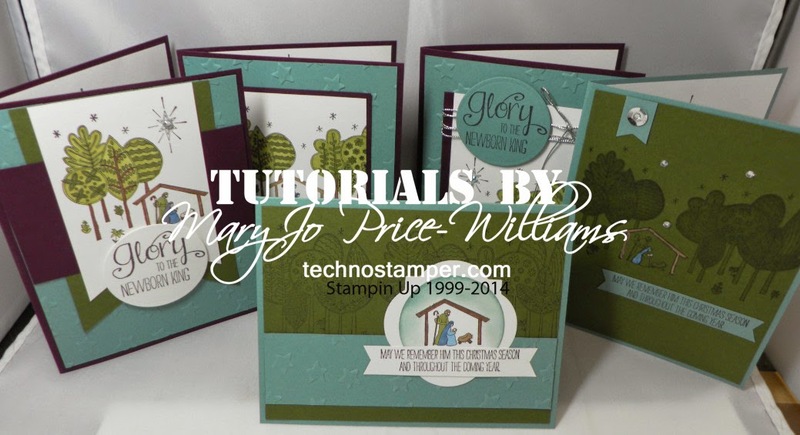 Use 100% current Stampin Up products (if it is current by you and not in the US you will need to state that in your post. Use the FEATURED SET OF THE WEEK. 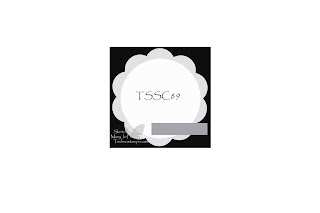 The sample does NOT have to be stamped now it can be one you already have done. 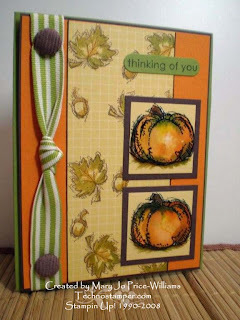 This set is so versatile and great for fall cards. I have a few samples for you that I did today and I will combine the ones I have done in the past with the re-cap at the end of the week. My first and second cards are for two other challenges too. First is the SUDSOL Case Challenge #1. And also the Latenightstamper's Step it up to the top challenge for this week. 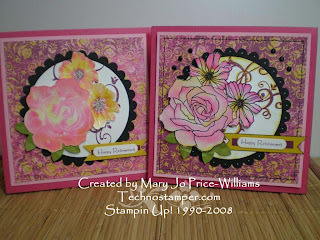 And finally I combined today's SCS sketch challenge with this set sampler challenge for this card. Don't forget to leave your sample links below on Mister Linky! You can find the supplies used for all cards at the end of the post. Here is her fabulous sample again for those of you who may not have seen it on the re-cap below. You can visit her blog at the link above the picture. 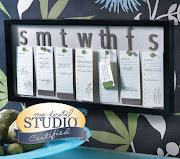 Congratulations Carla--you can save these up or spend them individually--max amount to turn in at one time is $25. Thanks to everyone who played, it was a tough choice. Wow, that was a long post! Hope you will play along. Not bad for week #1. Lots of fabulous samples. I will announce the winner of last week with the new week post coming up right after this. 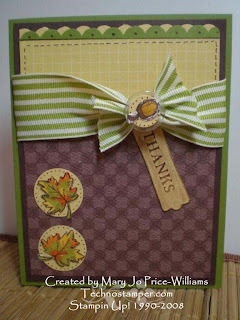 Thanks so much for playing along and remember you can continue to add to Mister Linky so we can see lots of great samples using specific sets. I will have a side bar button soon. I know you will find this hard to believe but I found another card that I made in the past that I don't like, lol--like that would be hard. But I don't believe I ever posted this on on my blog because I knew it was lacking something. So why not use it for the Step It Up challenge on LNS?! Here is the original card==I think it is just too dark and plain, but ok.
And here is the stepped up version. I like this one much better. What do you think? This is such a fun challenge, come on and play along. This week your challenge is to "Take it to the Top"!!! 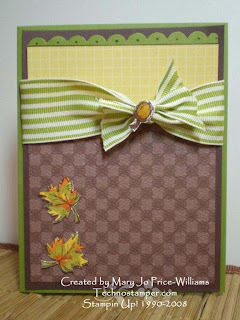 Find a card you've made in the past, or CASE a card from the catalog!! 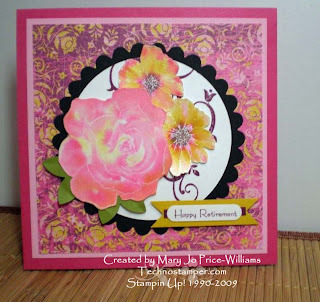 Now, re-do the card, and add some embellishments, texture, etc--to take it to the next level!!! Have some fun with this one!! 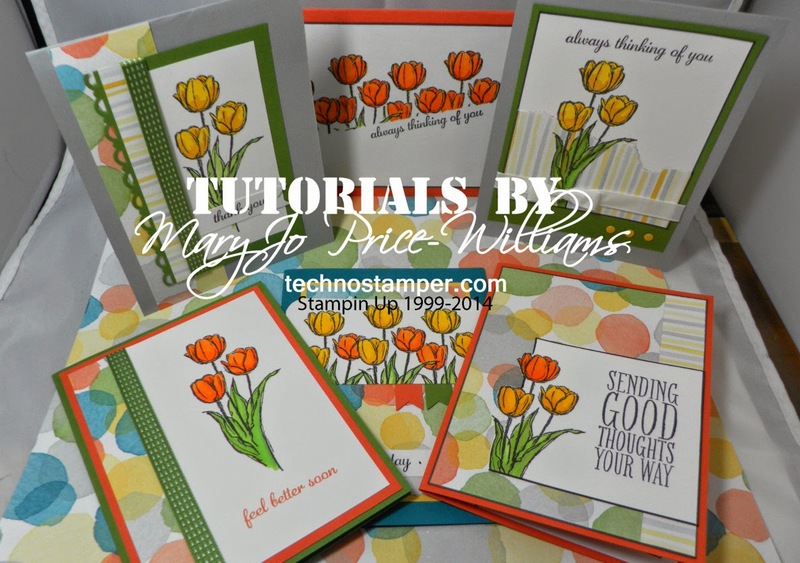 Be sure and post the before and after pictures (or tell us which card in the catalog you're using).As always, all materials must be current Stampin' Up! products. Deadline for submission is midnight on Sunday, October 4th! If you are not a member of this group yet you can be!!! It is free and fun for all--click here to join. Here is my first sample for this challenge. I made a card with very little time yesterday for my sketch challenge so I figure this is the one I will step up since I have a tiny bit of time, lol. So here is the before and after shot. I am posting on my blog now. 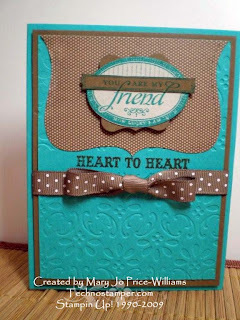 You can see the sketch challenge at this post--come on over and play along. 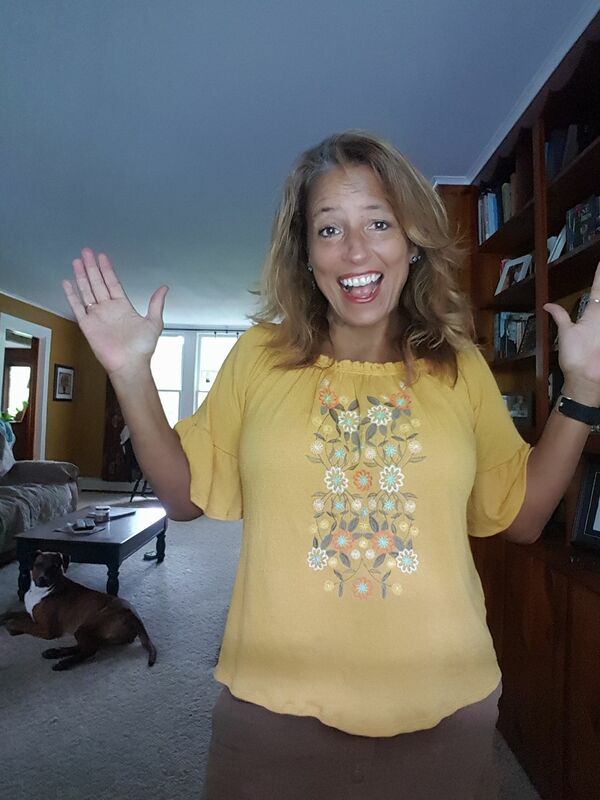 Let's work together to make this the best challenge yet since it is the last one for Gretchen and Tammy before Stephanie and myself take over the leadership role for the DT. We want to thank them for all their hard work! 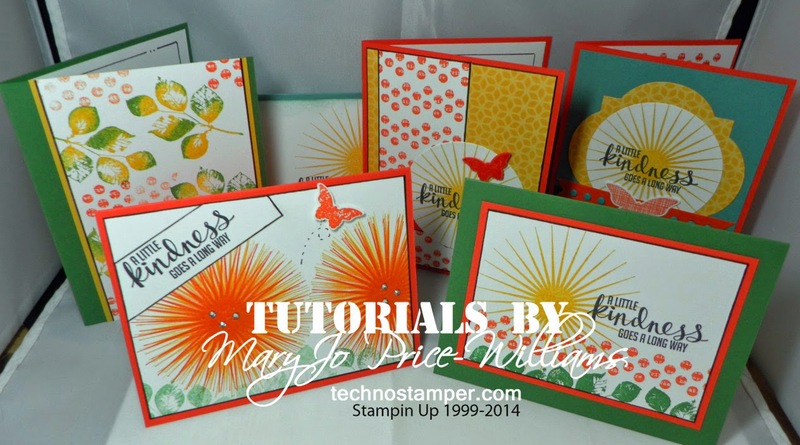 Other: word window punch, five petal flower punch, photo corners punch, circle scissors plus, large scallop circle Sizzix, re-inkers, clear embossing powder, aquapainter, water spritzer. What I changed or added. The embossing is now in black. I added brads, white gel pen dots on scallop, faux stitching around square layer, small black line around entire card, black line around the sentiment and made it a bit larger. Used the Curry marker to add more detail to the circle and added some curry ink to the edge of the circle. Thanks for stopping by, why not play along with one of these challenge--you will be glad you did. And I will be glad too, lol. This is a 6 by 6 card so that there is plenty of room on the inside for all the well wishes from all the co-workers. I used the re-inker spread technique. I am sometimes in love with this and some times so so--it does not always work out the way I want. But it is really pretty. 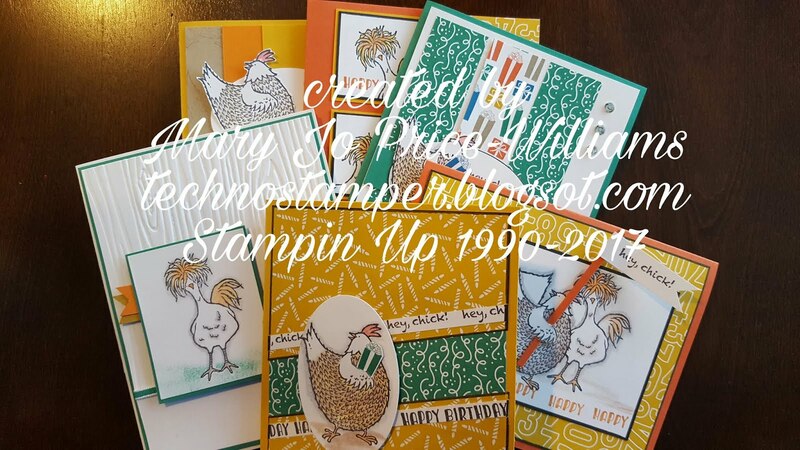 Don't forget to add your samples with Animal Stories stamp set to my new Wednesday Challenge--they can be any samples you have made or you can make a new one--hey, how about combining this sketch with that set samplers challenge! LOL! It would work. Thanks for stopping by today, and for all the fabulous comments you guys always leave. How fun this sketch was, I love all the samples and they are quite different from each other. 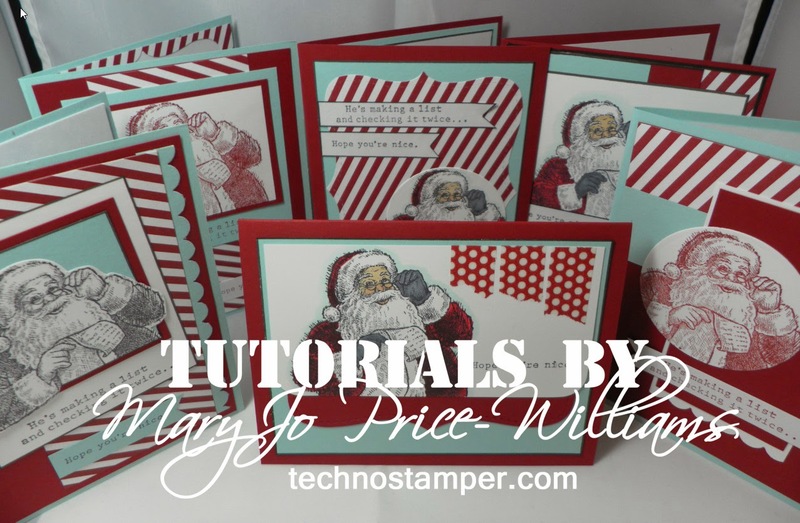 Don't forget to check out my brand new Technostamper's Super Set Sampler Challenge on Wednesdays. This week's featured set is Animal Stories! See ya in a bit with the new sketch challenge for the week.